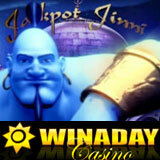 WinADayCasino.com has put its own unique spin on the popular “genie” slot machine theme with the new Jackpot Jinni that launched today on the site. Featuring a big blue genie, snake charmers and sultans the exotic new game is a five-reel slot with 18 pay lines, a bonus game and a special Cash Bonus symbol. WinADay is celebrating the launch of its latest one-of-a-kind slot machine with special bonuses, a free gift draw and an exclusive VIP bonus draw. Everyone that plays the new Jackpot Jinni 15 September to 22 September is automatically entered to win up to $500 in the Jackpot Jinni Best Bettors bonus. Players that spin ten rounds on Jackpot Jinni during the launch week will also be eligible to win another $100 in the Jackpot Jinni Gift Draw. VIP players will be entered in a separate VIP Draw when they’ve played ten rounds on the new slot machine and three VIP players will each win a $250 bonus. By collecting magic lamps players can earn ten free spins in a bonus game where three jackpots are available to be won. There’s also a Bonus Cash scatter symbol that multiplies winnings whenever it appears. Like all slot machines at WinADay, Jackpot Jinni is tied to the site’s progressive jackpot which was just hit in August for nearly $100,000 and is already nearly that much again. This month WinADay’s Game of the Month is the Jacks Show video poker game. Everyone that plays it is automatically entered in a draw for $500 in prize money and a chance to win a Dell Studio 15 laptop in a year-end draw. With new games added almost every month, WinADayCasino.com now has 18 unique slot machines, video poker, keno and roulette games that can be played only at WinADay. All games are instant-play so there’s no downloading or installation required.